It is not often that I get a chance to taste and talk with someone like Eric Aracil from Vins du Roussillon. We tasted a number of wines together and I understood quickly that Eric is very knowledgeable and passionate about everything concerning the Roussillon region of France. He was so enthusiastic when he spoke about the wine, the food, the terroir and the Roussillon area in general that I wanted to go there. Since there were only the two of us, I could ask as many questions as I liked. The five wines that we tasted were all naturally sweet and the wineries all all family owned. Eric said that these wines could go with many different food because of their natural sweetness. Eric said that the Banyuls area is located directly on the Mediterranean Sea, very close to the Spanish border. The sunny vineyards are on steep slopes and are planted on narrow terraces. Because of this the grapes are hand-harvested. These wines are made the same way as port. Banyuls Domaine De Valcoros Hors D’ Âge NV Vignerons Catalans. Made from 50% Grenache Noir, 45% Autres Grenache and 5% Carignan. The soil in the growing area is brown schist. The fruit is separated and traditional fermentation takes place and there is mutage (addition of grape spirits) on the must before pressing. During the fermentation, wine alcohol is added so that the fermentation stops. The residual sugar in the grape determines the sweetness of the wine. Then the wine is aged partly in new oak casks, partly in half-empty casks kept out-of-doors, and partly in large wooden foundres for seven years where oxidation takes place. Then refinement takes place in a climatized cellar until release. The wine is 16% alcohol and it is placed in 500ml bottles. This combination of different ripening methods makes Banyuls a totally unique wine that can be used both as an aperitif and a dessert wine. This is a rich warm wine with hints of prunes and raisins. 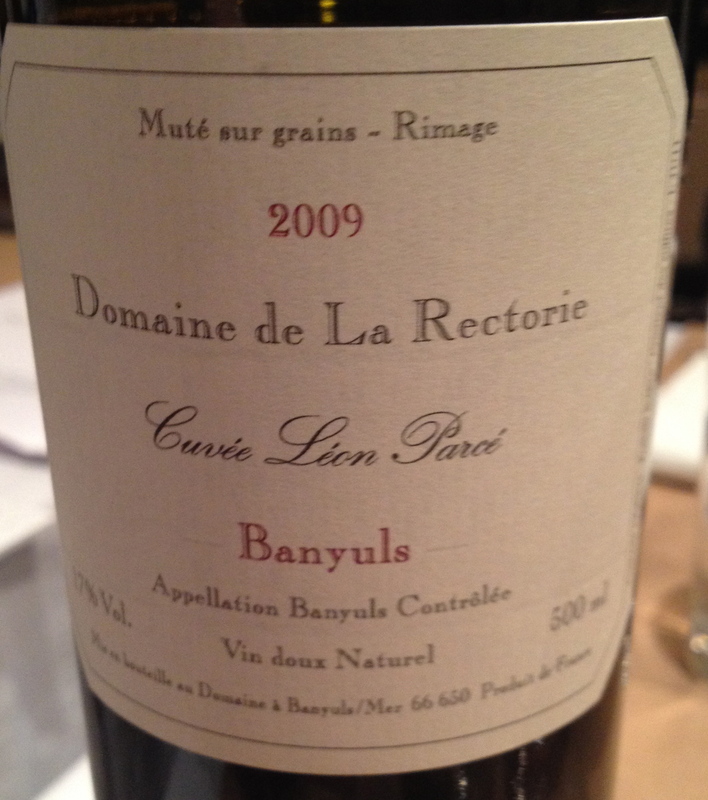 Banyuls Domaine de La Rectorie Cuvée Leone Parcé 2009. Made from 70% Grenache Noir, 20% Grenache Gris and 10% Carignon. The soil is Cambrian gray schist and the average age of the vines is over 50 years old. The grapes are hand picked a little later in the season which, Eric said, gives the wine more complexity and flavor. The grapes are then pressed and destemmed. After macerating whole bunches of grapes for a few days, fermentation is stopped by adding 7-10 % of neutral alcohol (96% abv) to the must. Alcoholic fermentation at controlled temperatures and mutage on the cap of the marc followed by three weeks maceration. Alcohol extracts the flavors of the grapes. The wine is aged in large oak casks for 18 months in an underground cellar before being bottled. This is a concentrated full-bodied wine with nice dark cherry aromas and flavors and a hint of pepper. 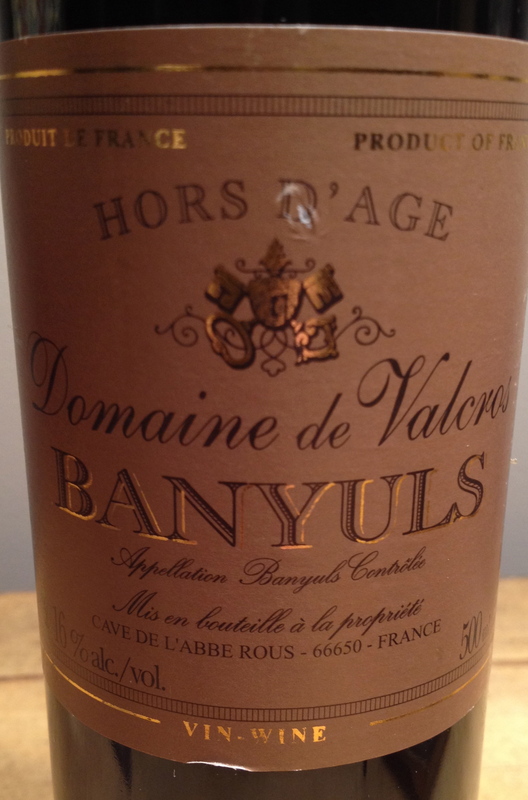 Eric added that Banyuls goes vey well with chocolate. 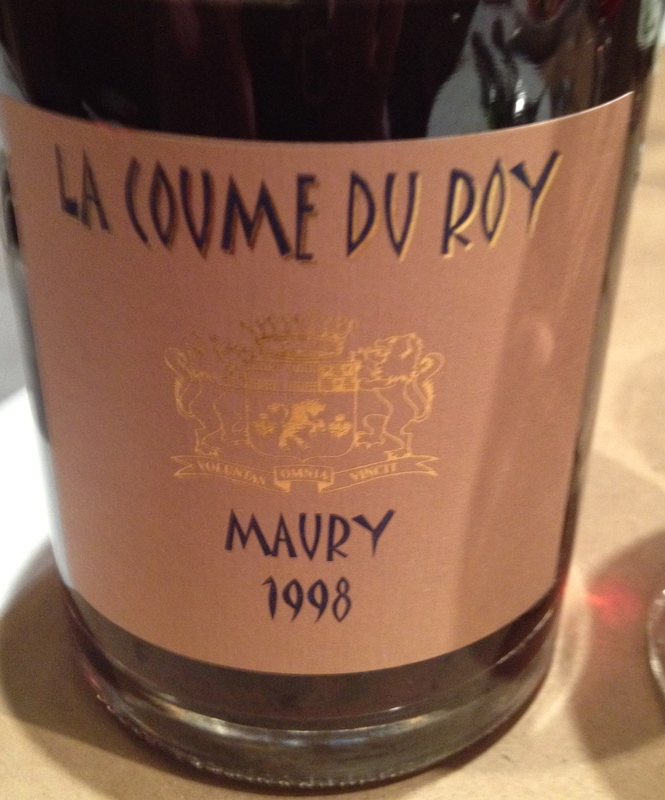 Maury 1998 Domaine De La Coume Du Roy 100% Grenache. The field of Coume Du Roy is located in town of Maury in the heart of the Agly Valley on black slate between the Pyrenees and the Corbiéres. The domaine is one of the oldest in the area and has wine for sale going back to 1925. The vineyards are facing south/south-east and the soil is aptian black metamorphic schist. The grapes are hand picked, destemmed and crushed. Alcoholic fermentation is stopped by mutage on the cap followed by a long maceration. The wine is aged in full vats and then bottled. This is a naturally sweet red wine. I was very impressed by this wine. It had aromas and flavors of dark berries with hints of cassis, blackberries and black cherry and a slight mineral character. Maury Blanc 2008 Domaine La Preceptorie made from Grenache Gris, Grenache Blanc and Macabeu. The soil is black schist and direct pressing by hand follows the harvest. Alcoholic fermentation and the mutage takes place on the must in 400 liter casks. The wine is then aged in 400-liter casks for 12 months. This is a well-balanced wine with exotic fruit aromas and flavors and a hint of apricot and pear. 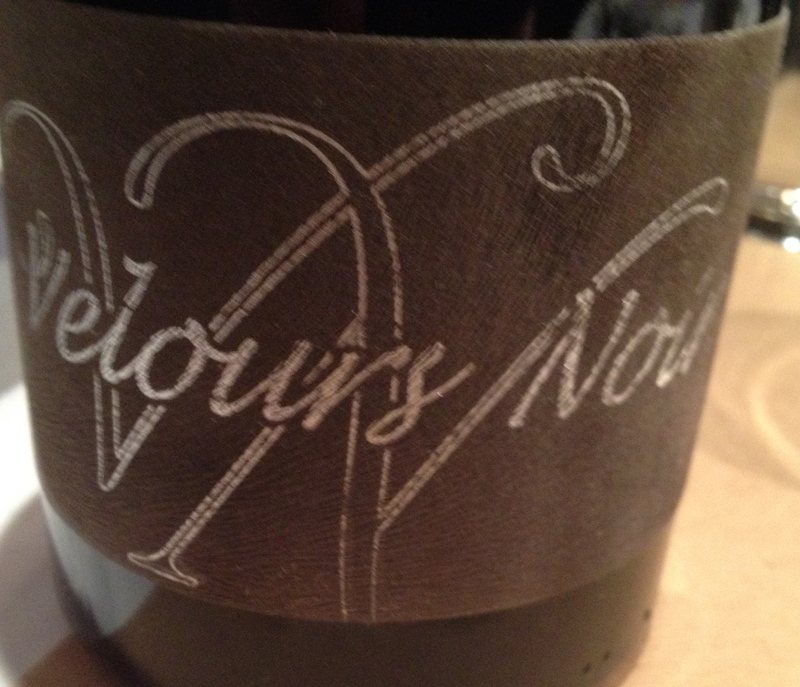 IGP Cotes Catalanes Chateau De L’OU “Velours Noir” (Black Velvet) 2010 made from 100% Syrah. The soil is black schist in the Maury Terroir 385 meters above sea level. Eric said that the wine maker is a woman. Prefermentary maceration at low temperatures then alcoholic and malolactic fermentation in new 300 liter oak casks with completely de-stemmed grapes. Eric said that the maturation is in the same open barrels that were used for the 9-month fermentation and added that it is unusual to have Syrah from this area. As the name implies, this wine did have a velvety quality to it, with nice dark fruit flavors and aromas and a hint of licorice.